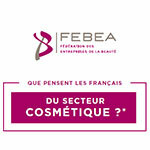 The Fédération des Entreprises de la Beauté (FEBEA) has just published the results of a study, conducted at its request by the IPSOS Institute, on the perception of French cosmetic products and companies. While 82% of them consider that this sector plays an important role for France's image, the study also reveals that most consumers have a partial vision of what cosmetic products are. What relations do the French have with cosmetic products? Do men and women have the same expectations and the same view of this sector? What products are considered cosmetics? These are the questions highlighted in this study, conducted from November 28 to December 4, 2014*. Cosmetics has a very positive image, associated with innovation, economic dynamism and the country's international influence. For 82% of French people, the sector plays an important role in France's image: - 86% consider the world of cosmetics as an innovative sector that contributes to the evolution of research; - 63% recognize its major role as a provider of jobs throughout France; - 57% consider that it illustrates French heritage and know-how in the world. On a personal level, far beyond the functional benefits expected, cosmetic products are considered to have a positive impact: - on the well-being of their users: 79%, - on the image they reflect of themselves: 74%, - on self-confidence: 66%. Useful or futile? The survey highlighted a very different perception of cosmetic products between men and women. - Confidence: 62% of women have confidence in the sector, compared to 41% of men. - Image: While 71% of women have a good image, only 41% of men share this opinion. - Perception: while men have a more stereotypical view of a sector that they consider futile, women have a more marked appetite for these products which, according to them, provide a feeling of well-being and make people dream. Stereotypes, always… The study also revealed that most consumers have a partial vision of what cosmetic products are. Indeed, when asked spontaneously to name products belonging to the cosmetics sector, 37% of them attribute make-up products to it first and 36% care products and creams to it. On the other hand, only 9% of the French associate perfumes and eaux de toilette with it, and only 5% use toiletries and hygiene products! However, the definition of a cosmetic includes hygiene and toiletries as well as skin care, make-up and perfume. Finally, the study reveals that 61% of French people feel that they lack information about the sector. "These consumer returns show the key role of our sector and our products in the national economy as well as in the daily lives of French people. This study also highlights a lack of knowledge of what cosmetic products are. There is a real demand for dialogue and education on product labelling and on taking environmental issues into account. As the industry's voice, we will work to answer these legitimate questions. commented Patrick O'Quin, President of FEBEA. Of course, we are waiting to hear more about these initiatives. This may be the case at the regulatory congress to be held in Chartres on 18 and 19 November, where this study will be the subject of a more detailed presentation. The Observatory of Cosmetics, which will be present at this congress, will not fail to mention it. * "Image des produits et de l'industrie cosmétique", Quantitative study from 28 November to 4 December 2014. Online self-administered study via the Ipsos panel, of 1,013 French Internet users constituting a representative national sample of the population aged 15 and over (quota method).